A Birmingham Guild of Handicraft, Arts & Crafts brass coal bucket with stylized hand formed pomegranates. Retaining the original liner. The Birmingham Guild of Handicraft was established in 1890 by local admirers of William Morris and John Ruskins' work, producing very high quality Arts & Crafts metal work, lighting and fine books. Arthur A. Dixon, Birmingham Guild of Handicraft Ltd.
By Birmingham Guild of Handicraft Ltd.
A Birmingham guild of handicraft copper planter with stylised brass organic sinuous handles. 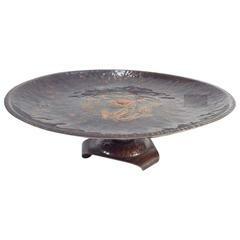 A rare handmade Birmingham Guild of handicraft copper center piece, with stylised repouse floral details to the surface, on triform base with curled under feet. Stamped BGH. Brass barrel-shaped coal with brass handle. Faux crocodile pattern copper and brass coal or firewood log box. 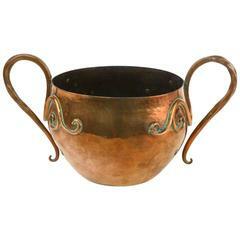 Offered for sale is this 19th century antique brass coal bucket in the form of a cauldron. Nice shaped handle standing on 3 legs. Lovely color and condition.